Dr. Margaret Wilson, a retired pediatrician, knows firsthand of the financial struggles of medical students. While cost of tuition at SIU School of Medicine remains one of the most affordable among public universities, medical students graduate with some of the highest debt – more than $210,000 on average – according to Erik Constance, MD, associate dean of medical student affairs. “Scholarships are imperative for fulfilling our mission of sending well-trained providers in our central and southern Illinois communities,” Dr. Constance said. To help future generations of female physicians, Margaret established a scholarship for female medical students at SIU. Her hope is that this scholarship will help make life a little less worrisome for the student and her family. “These students have families, and they’re graduating from medical school with these huge debts,” she said. While his wife’s generosity was bestowed on the medical students, Dr. Charles Wilson, a retired professor in SIU’s Division of Urology, wanted his gift to impact the work of his chosen specialty. As Drs. 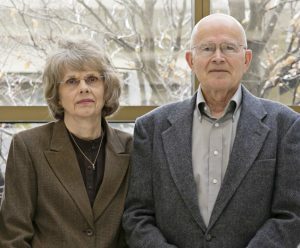 Margaret and Charles Wilson enjoy their retirement, their son, Morgan Wilson, MD, ’05, is enjoying his career at SIU Medicine’s Division of Dermatology. Not only has Morgan generously supported the scholarship his mother began, but he also supports the Student Resource Fund and the SIU Dermatology Alumni Fund. Though the Jacksonville-based couple and their son chose different medical specialties and different areas to give, all agree that they’d like to help support the mission of the medical school and keep quality physicians in Illinois.